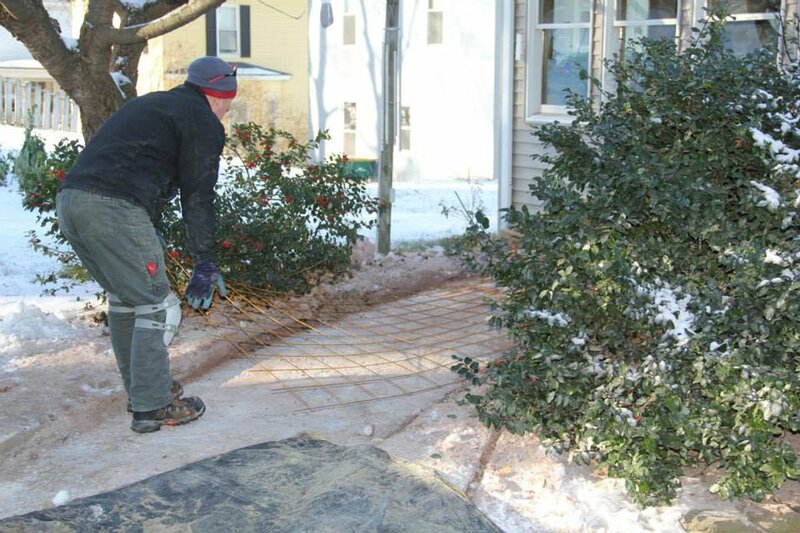 Follow our detailed guide and learn how to install a snow melting system for walkways and paths. Have you ever seen snow fall on an already warm car? It melts instantly. 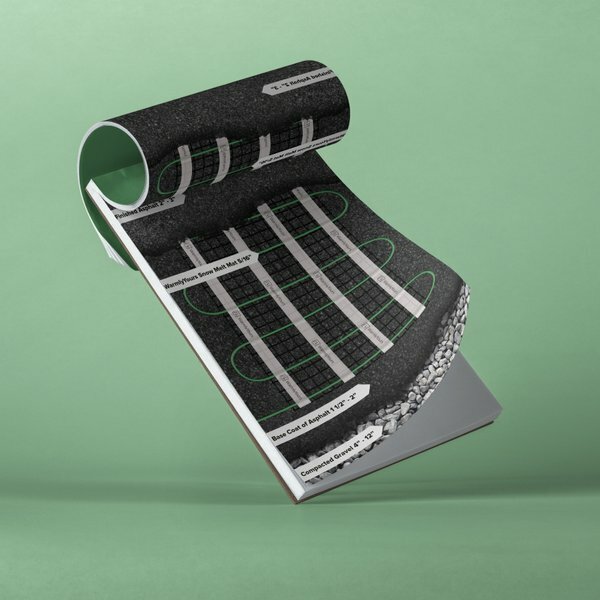 This is the essential idea behind snow melting systems—a heating element is embedded in your driveway (or patio, walkway, etc.) and it melts the snow that falls on it. Like any outdoor surface, walkways or pathways can benefit from installing a WarmlyYours snow melting system (available in both mats and cables). Designed to install directly in concrete, asphalt, or in mortar beneath pavers, our cable snow melting systems ensure that driveways, patios, walkways, ramps, or stairs stay ice and snow free, allowing for safe passage. Perhaps the most important stage in installing a snow melting system is getting a good installation plan. WarmlyYours provides a free, no-obligation SmartPlan that includes an installation plan, an electrical plan, and an itemized quote, all of which is prepared by a highly skilled team of engineers. All you have to do to take advantage of this service is to provide WarmlyYours with a sketch of the project that includes dimensions and other relevant information, like where power will be most readily accessible. Within typically one day of providing this information, you'll receive your free SmartPlan. The itemized quote included in your SmartPlan will also include MSRP pricing so that you can properly budget for your project. a walkway or path is either being created for the first time, redone, or expanded. These kinds of projects are typically undertaken from late spring to late fall. This is because it’s important that the ground temperature is above the freezing point. The example pictured is of a walkway improvement that will double as an accessibility ramp. This walkway, with a very gradual slope, is leading to a detached garage behind the house for wheelchair accessible van. 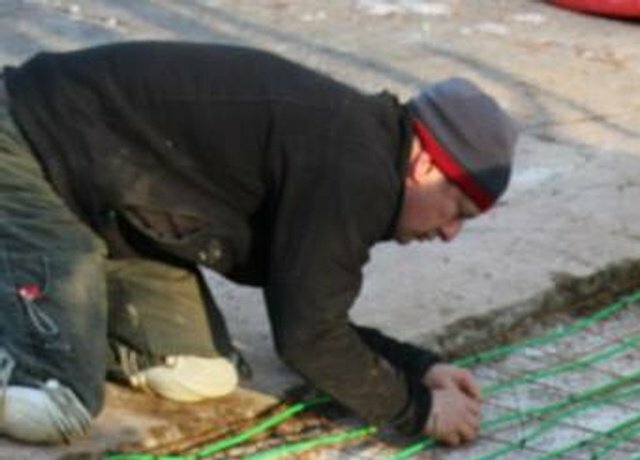 This project is using electric snow melting cables embedded in sand beneath pavers. 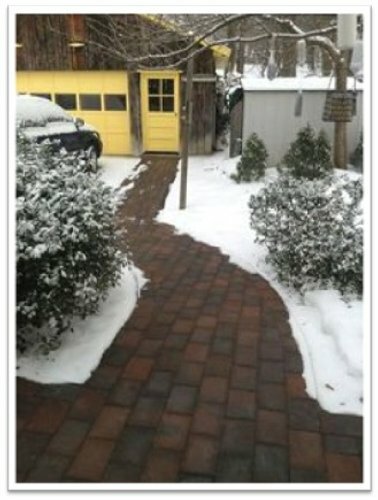 By adding the snow melting system, the customer is sure to have a clean path to the garage. Because this snow melting system is electric, it can easily be expanded in the future if these homeowners decide to add to the walkway. The thinness of an electrical snow melting system means it has a minimal impact on the overall depth of the walkway or ramp. These snow melting systems can be used not only with concrete, but also with a variety of different surface types, like pavers and asphalt. Each surface type will have a different cross section with suggested depths. 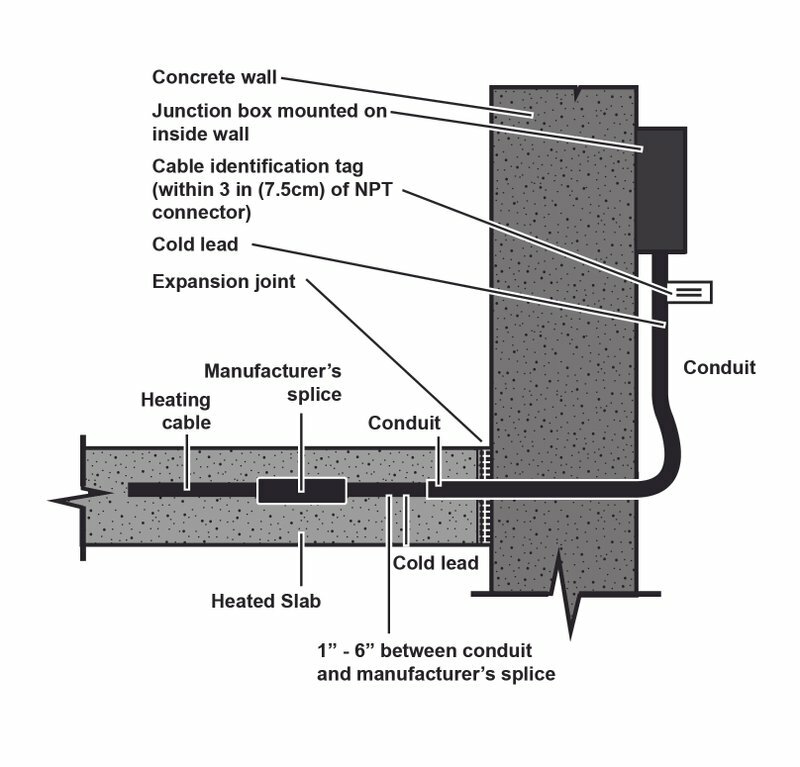 For snow melting cables, like the ones used in the projects featured in this guide, it’s important to include a rigid framework for the heating elements to attach to. This ensures the heating system will maintain the proper spacing and depth in the finished project to function properly. Often, installers will use a rebar frame or wire mesh that is secured so that it lies flat. Then the cables can be attached to the framework with zip-ties. 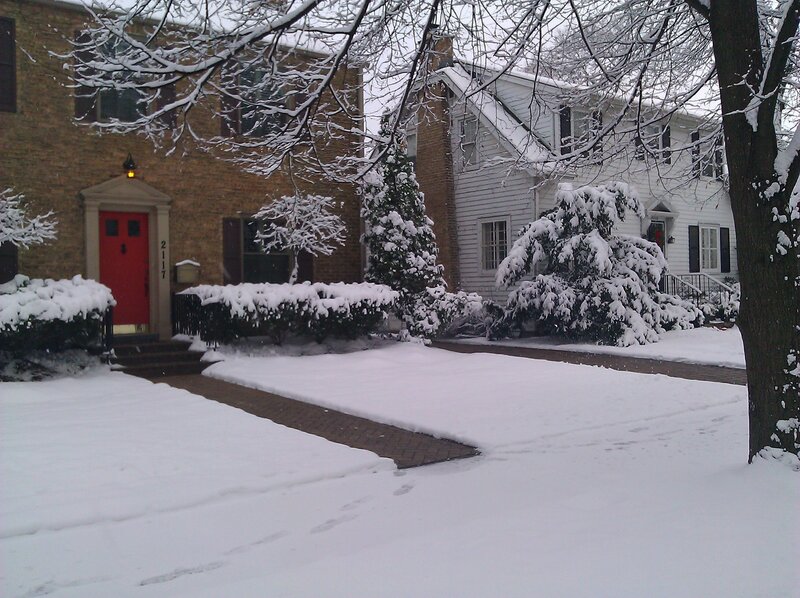 If you want optimal results from a snow melting system, maintaining the proper spacing of the heating elements is key. The heating cable or mats should be attached to the framework using ties to maintain proper depth and spacing, 3” (76mm) for free-form type cable. Snow melting mats already have the desired 3” spacing built into them, but care should be taken to make sure parallel runs of snow melting mats are still spaced so that cables are 3” apart. Reference the WarmlyYours custom SmartPlan installation plan, provided free with every quote, so that this process goes smoothly. 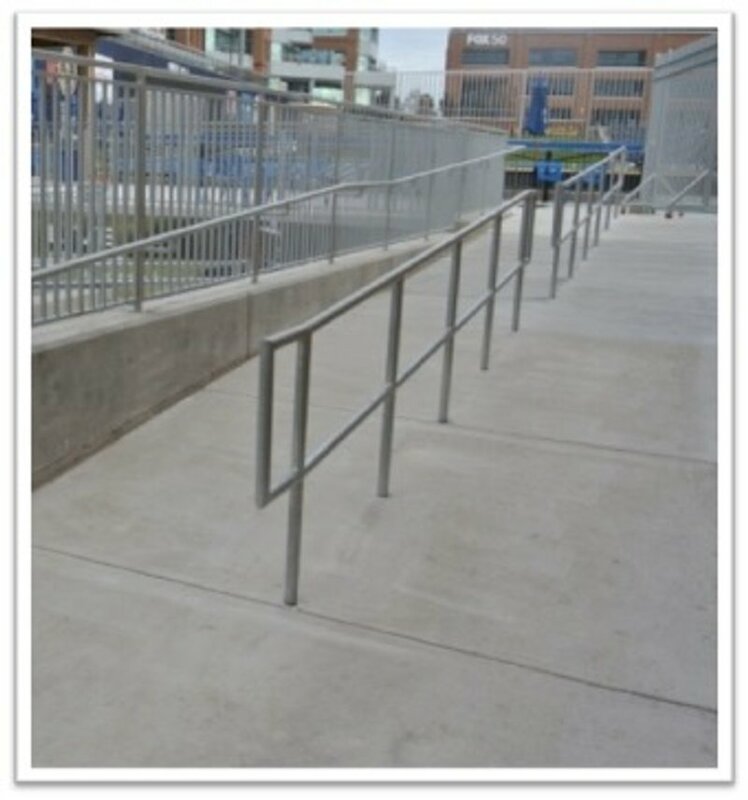 For installations in stairs, ramps and walkways that will include handrails, it is strongly recommended that the installer put in pre-sleeves for the posts to avoid as much drilling of the surface as possible. The heating cable must be routed around these sleeves or posts to avoid any direct contact with them. It is the responsibility of the electrician and the installer to coordinate their efforts so they avoid saw-cutting or drilling through heating cables that are no longer visible beneath the surface. Note: Avoid allowing the heating cable, or metal framework, from making direct contact with the posts or any other metal fixtures. 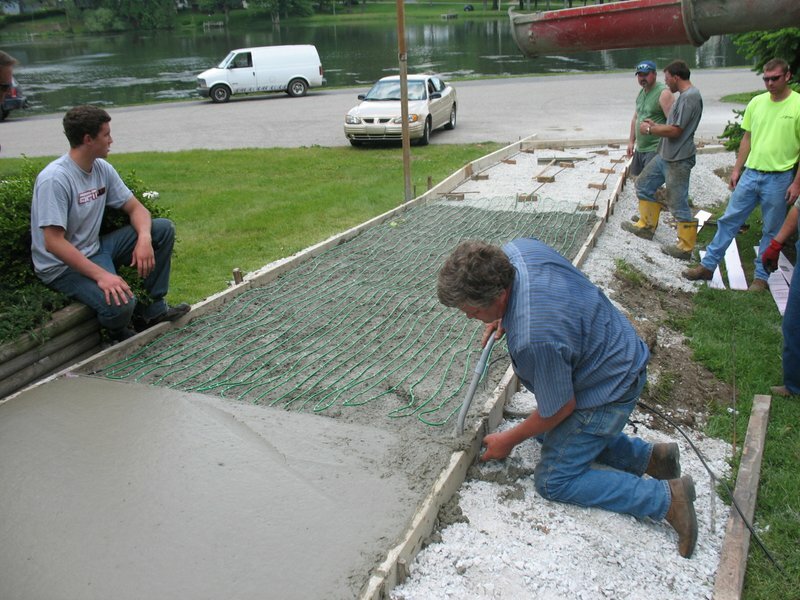 Concrete or cement installs can be done in two different ways: 1-stage pours or 2-stage pours. For 1-stage pours, the framework (with attached heating element) must be propped up so that the heating element will be 2-3” below the finished surface. Once that is done, the concrete can be poured on, around, and over the framework. See the WarmlyYours snow melting installation manual for more info. 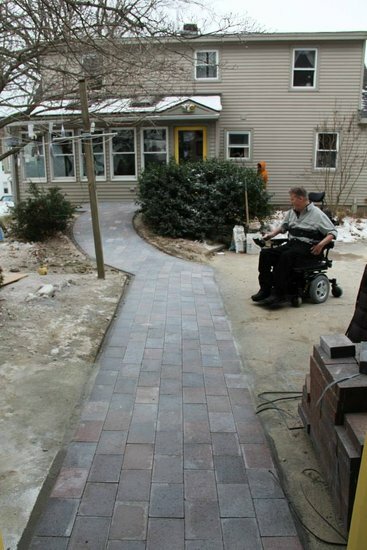 Care must be taken by the paver installer so the mortar (or other medium) covers the heating element so that no direct contact with the pavers is made. We recommend that at least 1” (25mm) thick mortar is poured over the heating element, but no more than 1.5” (38mm). If using sand or limestone screenings, cover to an uncompacted depth of 1.5” (38mm), leveled to grade. 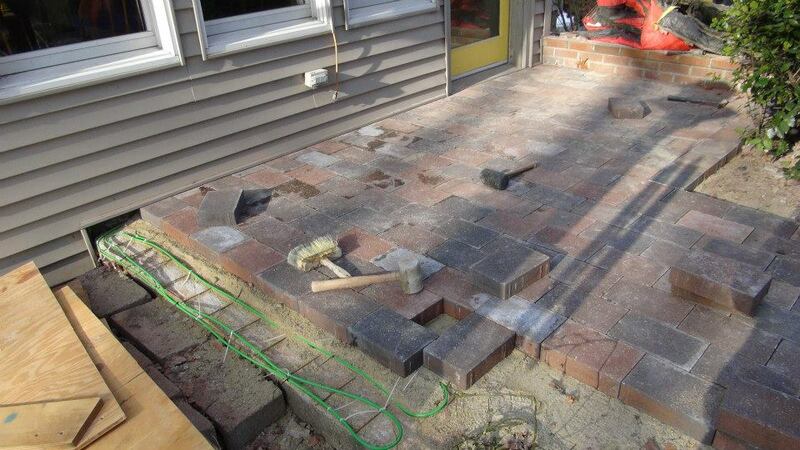 Avoid dropping pavers into place, as doing so may damage the heating element. Brick or stone pavers must NOT be any thicker than 2.5” (63.5mm). Please note that snow melting mat pictured will be completely covered before the pavers are finally placed. The power is carried to each cable by a “cold lead,” which is connected to the heating cable via a manufacturer’s splice. 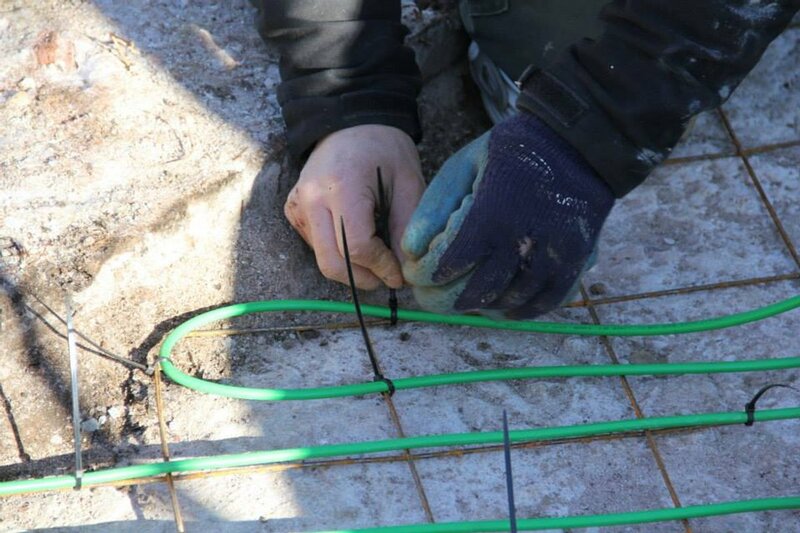 One of the most common snow melting installation mistakes that people make is leaving this splice, and some of the heating cable, outside of the concrete or sand (sometimes people leave it in the conduit or simply leave it exposed). This can cause the splice, which is half heating element, to overheat and fail. By simply making sure that the splice is embedded, you’ll ensure that it has an appropriate medium (like concrete, sand, or stone dust) to prevent overheating. Once your project is completed, it’s ready to be used. Just add snow! Make sure to monitor your system and control throughout the first couple of snowfalls to see if any adjustments are required. WarmlyYours offers a wide variety of controls for our snow melting systems—from a manual option with a timer that will only activate when you turn it on/off, to an automatic option that will turn on when it senses snow is falling and the ambient temperature is below a certain threshold, typically 38 degrees Fahrenheit. These controls (with the exception of the manual Timer Control option) are able to function with the use of sensors. There are two main types of sensors: slab and aerial. Slab sensors are installed along with the heating element (but never touching it) and they can measure the conditions at the surface (slab sensors are not recommended for use with pavers). Aerial sensors are installed in the open and are actually able to detect whether or not it’s snowing. For more information about the variety of snow melt controls and sensors available from WarmlyYours, check out our comparison chart. 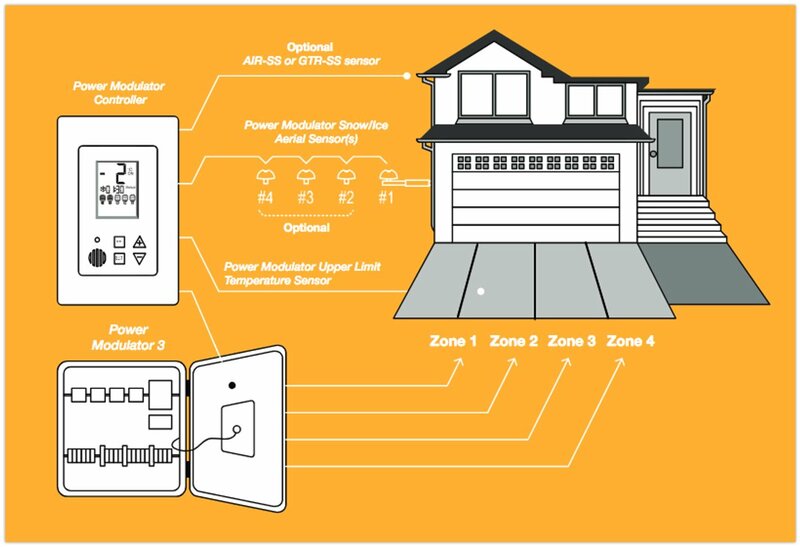 Learn about Zoned Control for your Snow Melting System The WarmlyYours Power Modulator control reduces spending by offering a built-in GFS (ground fault sensor). As you can see, this snow melting system will keep your walkway usable, even in the dead of winter. In this picture, you may notice that the melted area is fairly wet with melted snow. Most WarmlyYours snow melting systems will continue to run past when the snow stops falling. This will typically evaporate the water left behind, and in its place, you’ll find clean, dry pavers or concrete. Snow melting systems like this allow you to do away with chemical melting agents, which will be easier on your pets and your vehicles. It will also be much easier on your body when you can officially retire the snow shovel. For more information about the snow melting systems available from WarmlyYours visit our snow melting section or call 800-875-5285. *All pricing information is MSRP. Operating cost calculation is based on the national average of $0.08 per kWh, but consumption may vary based on individual conditions. The WarmlyYours Power Modulator control reduces spending by offering a built-in GFS (ground fault sensor). This eliminates the need for a GFEP (ground fault equipment protection) breaker for every heating element, which means significant cost savings for the project. Featuring four contactors and a built-in ground fault sensor, the Power Modulator 3 allows customers to control one or multiple zones one at a time, thereby saving money and handling a higher amount of power than the average control. This electrical box enables customers to use one contactor per zone for up to four zones.